The Push Button House by Adam Kalkin is a fully functional living space that opens and closes with relative easy...easy to ship and ready to use. 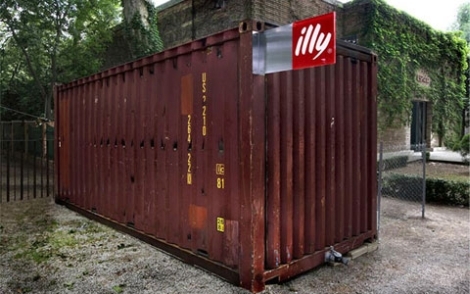 A great addition to the container collection! Via architechnophilia. Good you-tube video showcasing an interview with Leo Marmol, managing principal at Marmol Radziner, considered by many to be the leading firm in designing and building customized, green prefabricated homes. 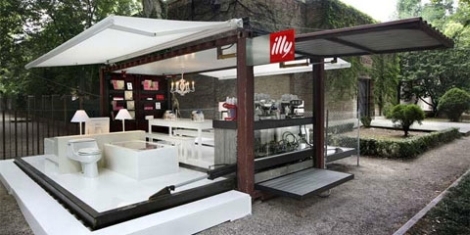 Good insight on the prefab movement and actual prefab building process. The host is corny (Starbucks reference) but still a good video. Check out the mkLotus...the latest design from Michelle Kaufmann as seen at West Coast Green in San Francisco last month. Rolling Huts Place Prefabs On Wheels! 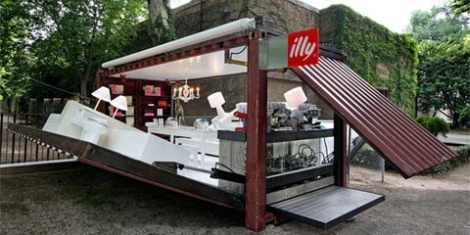 A prefab on wheels? That's right...it started in 2005 when Olson Sundberg Kundig Allen Architects ("OSKA") and lead architect Tom Kundig built the Delta Shelter. 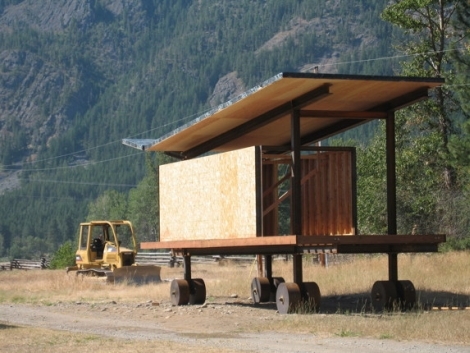 The Delta Shelter is a 20' x 20', 1,000 square-foot weekend cabin that was constructed in Mazama, Washington (pictures on the next page). Not surprisingly, the owners also wanted something for thier guests...and as a result, the rolling hut was born! 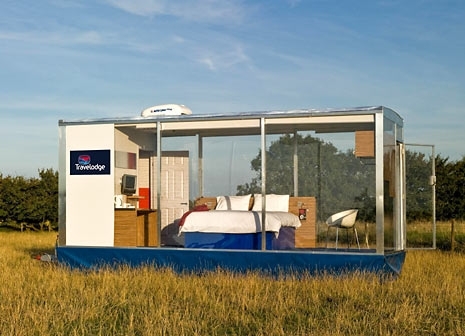 Travelodge recently announced the creation and limited use of the Travelpod...a line of prefab-esqe, mobile hotel rooms that can be transported to camping sites or large venues, like sporting events, and rented out like traditional hotel rooms. The pod is a polycarbonate glass box that has all of the amenities a normal hotel room would have like carpeted floors, air conditioning, cable tv and even blinds! Via here and here. The JoT House (and Mini-JoT)! 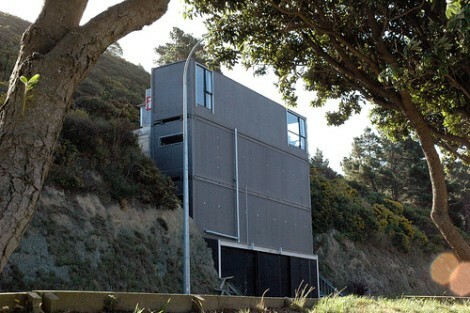 The JoT House is stripped-down, clean, modernist, open-planned, natural light filled, inexpensive and cool. For around $100 per square foot, you can have one of three different models. Two are pretty spacious. The JoT original and the JoT L are 1,344 and 1,500 square feet, respectively. 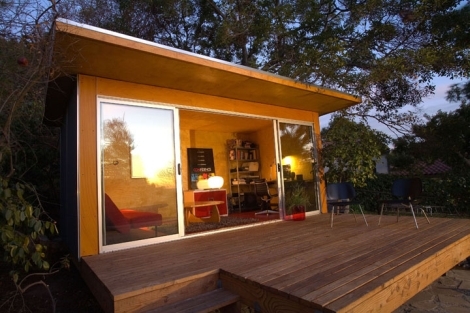 The Mini-JoT is just 128 square feet, which is perfect for a little studio, getaway, guest-room, whatever. Designed as a small home by BARK (a Canadian design company), this cabin of sorts was made using the standard ISO shipping container...built grid ready, it can be transported by train, truck, ship, airplane or helicopter as a normal shipping container. 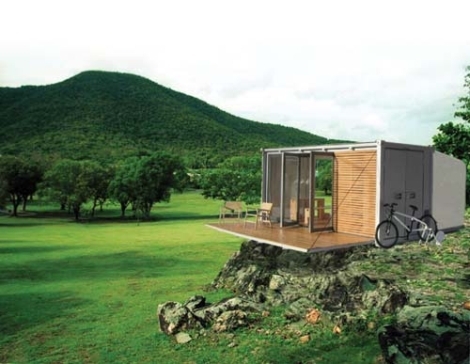 Once it arrives, it opens up to 480 sq/ft of prefab living space with features like solar panels, glass floors, low-flow shower-head, LED lighting, concrete sinks, bio-diesel stove, and even a water management system! Modular Pod Community Built in Taiwan...in the '70s! 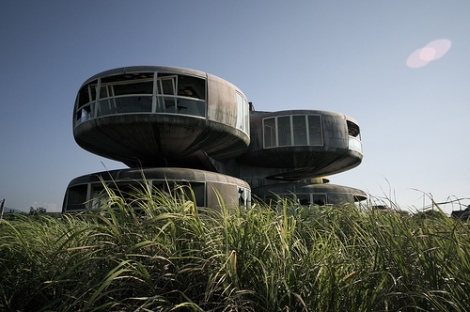 Apparently this pod community, with an ocean view, was built just off the North Coastal Highway in Taiwan back in the 70's. Modular pods built on the ocean, that blows me away! It was definitely built before its time. It looks as if it hasn't been inhabited for years. I would love to see something like this today, built green with all the modern conveniences right on the coast of California...maybe with a little more spacing but same great idea!